I went back and had a long and interesting conversation with a deply engaged, very knowledgable sales person, who's been with the shop for years, about what fountain pen would be a good one for me to use for sketching. I had realized over the last few weeks that so many of the sketchers (http://www.urbansketchers.org/) that I admire most, and whose line quality I love, use a fountain pen. They also often mention Noodler's fountain pen ink. 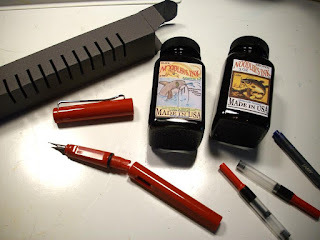 The shop carried a broad sample of Noodler's - and that plus the expert help ended in the purchase of several bottles and my first bottle-filled fountain pen. If his prediction is correct, it might also be my only fountain pen. It's a Lamy, and the shops's clientelle continue to buy ink and supplies for Lamys they bought there twelve years before. When the sales person asked how I meant to use the fountain pen, I told him for sketching. He asked what kind of sketches. It was a pleasure to pull the moleskine from my pocket and open it to show him... I love having the means with me all the time. I've since done a few brief sketches with the fountain pen - only one complete sketch so far, but I already like the feel, and it makes my hand more free. I find that new tools (in my case, lenses) change the way I see things, and in fact even what I look at. I love how this dovetails with a discussion on a writer friend's blog about using a fountain pen to write longhand. The little sketches on the bottles are sweet. Enjoy your new pen and inks! I spent many years drawing with a .003 Rapidigraph simply because it allowed such incredible detail. In the long run they became too difficult to maintain so when I returned to b&w drawing I bought a collection of Microns and Staedlers, then a Rollerball stick and multiple nibs. It's nice to have a pen that can go from fine lines and beyond without switching. Your Lamy sounds like a cool instrument and I may have to see if I can find something suitable. The drawing you made of the sculpture came out very well. Very seductive fountain pens they appear to be! I love fountain pens, but I think I've made the mistake of buying the one that is most accessible. I end getting frustrated with them and then they sit in piles in my drawer...abandoned. I shall have to look into these!